Josh's Journey | Sharing my experience going through Chemotherapy and recovering from a brain tumor. Last time I updated all my amazing readers on the progress of my journey, I was in the home stretch. I was away with my grandmother enjoyed some R&R before heading back to DC to finish up the school year along with my last eight rounds of chemotherapy. 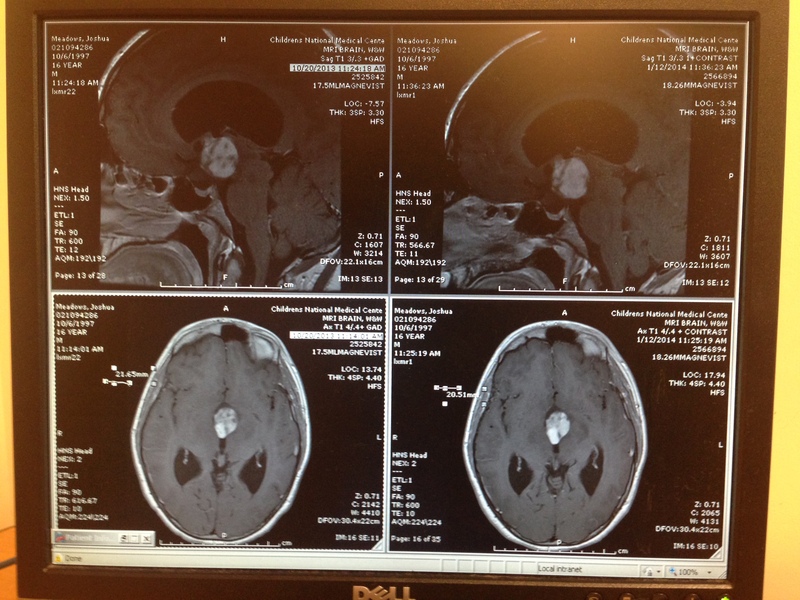 Upon my return to DC, I had my next MRI which revealed no increased growth or any change. This meant that my family and I were cleared to finish up my treatment of Vancristine and Carboplatin and be done for the foreseeable future. Well, I have some very good news. On June 12th at about 5:30pm, I finished my last chemotherapy infusion at Children’s National Medical Center in DC! The last roughly three months of treatment did, however, come with a few hiccups. As I proceeded through my last infusions, my reaction to the chemo became increasingly worse each week. My ability to bounce back from each infusion was nothing compared to what it was when I first started. Although this was somewhat expected, it was still quite unpleasant. Around the time of my last post, I would do an infusion on Thursday afternoon and if I took my normal prescriptions, I would be well enough to force myself through an abbreviated school day on Friday and then I would be fine by Sunday afternoon. This slowly changed and by then time I reached my forth-to-last infusion my normal cocktail of drugs for coping with the side-effects just wasn’t cutting it. During that forth-to-last infusion I was extremely sick, didn’t make it to school that Friday or Monday, and just couldn’t eat anything. It was at this point my doctors added a drug called Emend to my regiment.The effect of the drug, as it was described to my parents and I, is that it helps the other drugs that counter the effects of the chemo have an increased impact. At first I only took Emend while I was in the hospital as one of my pre-meds before doing an infusion. However, once the side effects started to become increasingly worse (forth-to-last infusion sort of worse) my doctors wrote out a prescription to take the drug at home. It’s always taken in pill form, even when in the hospital. The prescription did come with a slight warning, which was that many types of insurance don’t cover the drug and it can be frightfully expensive if you have to pay for it out-of-pocket. Luckily, I have one of the types of insurance that does cover it. This is one of the things I’m extremely thankful for: amazing health care as well as being in a situation where my family can afford fantastic health coverage. It was also around the time of when we added the Emend that my family and I had a serious talk with my oncologist, Dr. R, about finishing treatment. What he told us was that we would see what my reaction was like once the Emend was added, but that if the drug didn’t work we would just stop treatment two of three infusions short of the total plan. Apparently with all the drugs I was taking at the time, Emend was basically the last thing they could add to help deal with the side-effects. At that point, with only a few infusions to go, there would be no point in finishing out the last few if they were still making me so sick. As he described it, there’s no way of knowing exactly how many infusions it takes to kill this sort of tumor. They think it’s somewhere around forty-two, but it could be less or more and that’s why there’s no crucial reason to do exactly forty-one. Luckily the Emend had a big impact, and on June 12th I arrived at the hospital with my entire family, including my grandmother visiting from overseas, for my last infusion! I was very happy to make it to my last infusion; of course I didn’t want to be sick, but I also wanted to finish what I had set out to complete. My family and I brought in a big cake to thank my entire team at the hospital, everyone from doctors to nurses and everyone else were all so amazing. We were able to take a photo of the cake (only one piece short of the completed thing). It was a fantastic feeling finishing treatment. It was also, however, sad saying goodbye (even if only temporarily) to such an amazing team of people. It was at that time that my entire family and I looked back on being diagnosed sixteen months beforehand, being admitted to the ICU and having neurosurgery and then completing forty-one rounds of chemo between two different cities, hospitals, and teams. 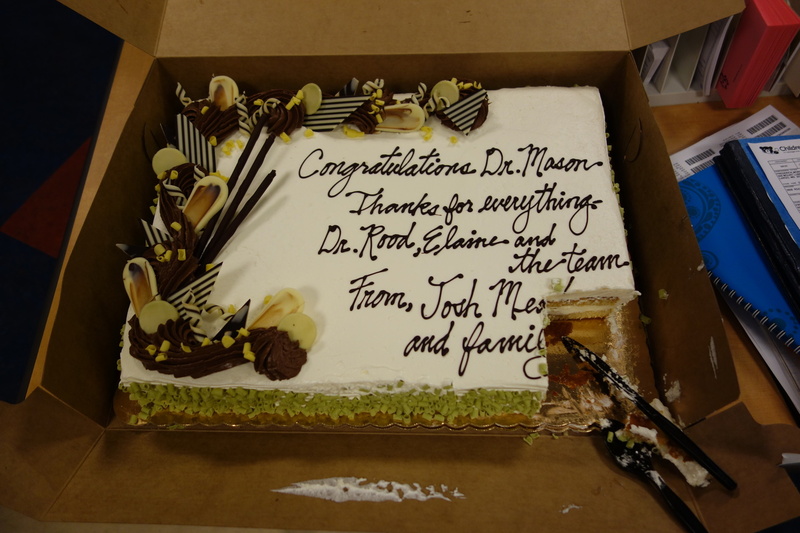 This was the cake we brought in to thank the entire team at CNMC. Everyone got a slice! Amazingly, Dr. Mason, who was the first person I had contact with at CNMC, was doing his residency in neuro-oncology. His last day of residency was also the day of my last infusion! Dr. Mason and I. His last day of residency, my last infusion. A photo with my oncologist and my nurse practitioner. Couldn’t have done it without these amazing professional, people! 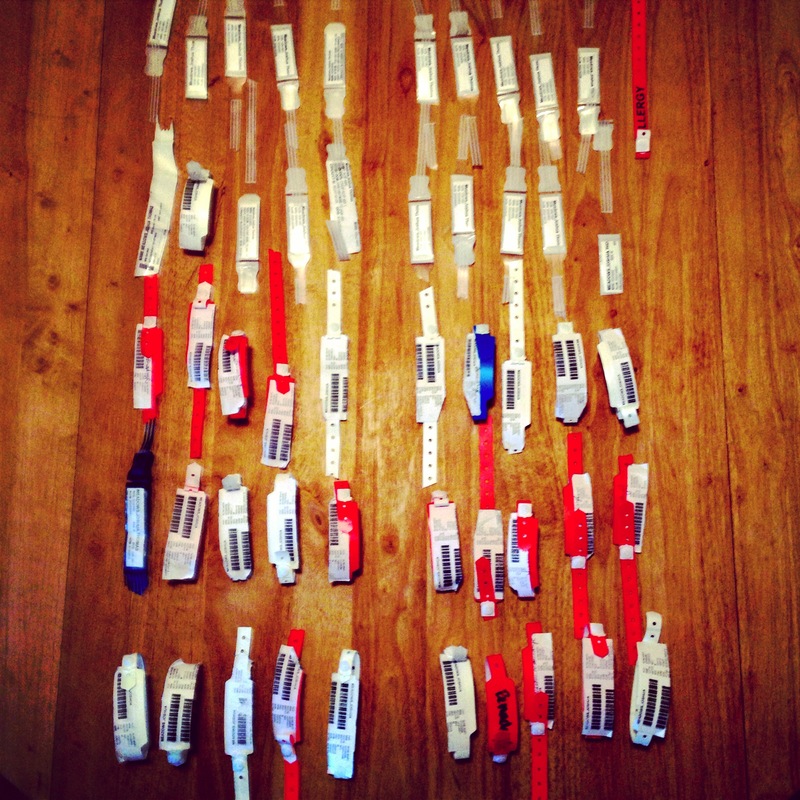 Exactly a week after my last infusion I decided to count up all of the hospital bands which I had saved from my journey. To do the math: 1 brain tumor = 16 months of treatment = 6 MRIs (at the time) = 41 rounds of chemo = 51 hospital bands. 51 bands from both Philly and DC. 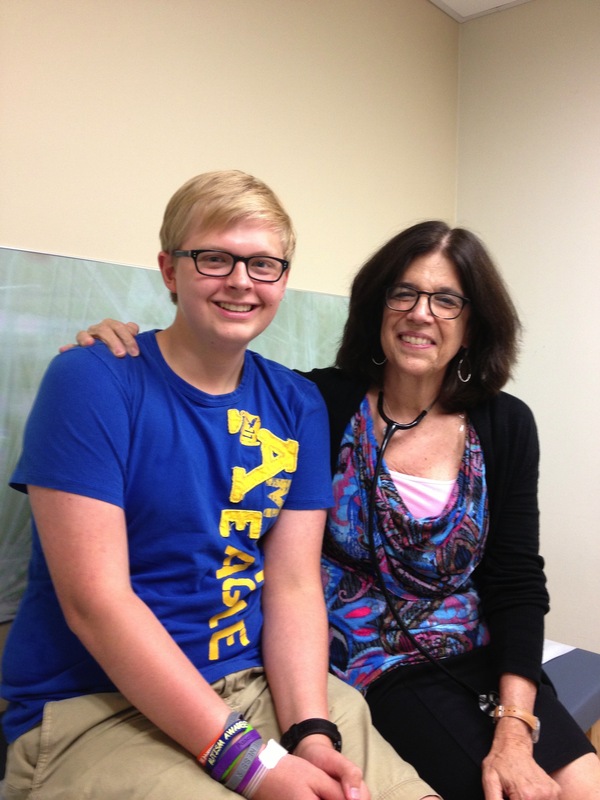 Everything from MRIs to surgeries to chemotherapy infusions! All that was left to be done was have my port removed and a few days later we received the call that on the 27th of June I would be going in for day surgery to have my port removed. Interestingly, most people don’t have their ports removed until they get two clean scans back. However, Dr. R told us that if the tumor, Eugene, was to begin growing again I would most likely start taking an oral drug instead of doing infusions so we decided to take it out. Therefore, early on the morning of the 27th, we made the trip out to the hospital where I was admitted and had the port taken out. One of my big requests was that I could take a photo with the surgeons before going under and that they would take a photo of the port for me once it was taken out of my chest, which they did! 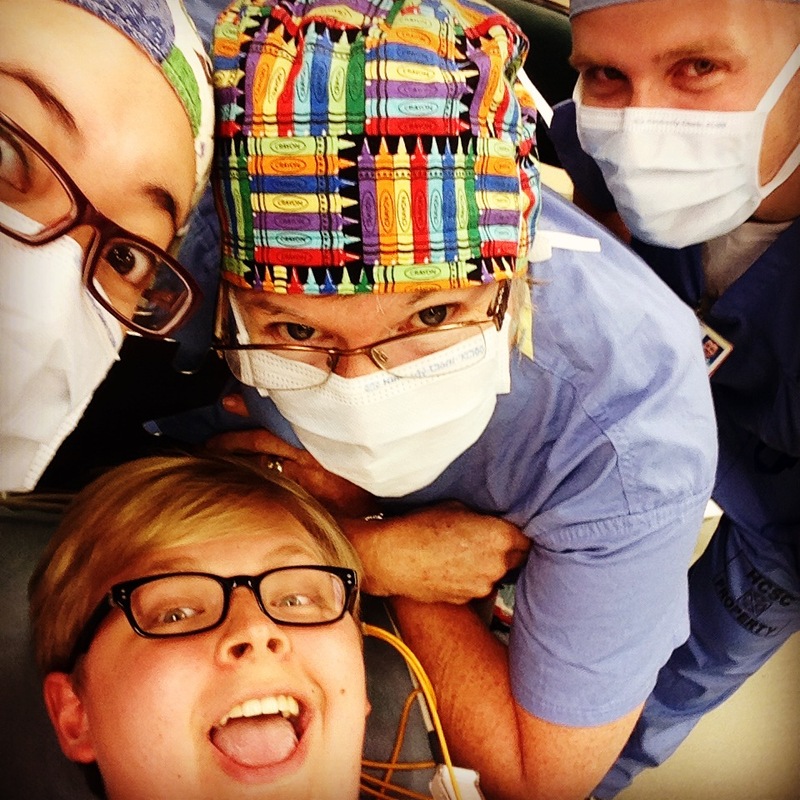 I took a selfie with the surgeons right before going under. Don’t worry, they were super cool with it. On of the nurses took this photo as they were putting me to sleep. Thumbs up! 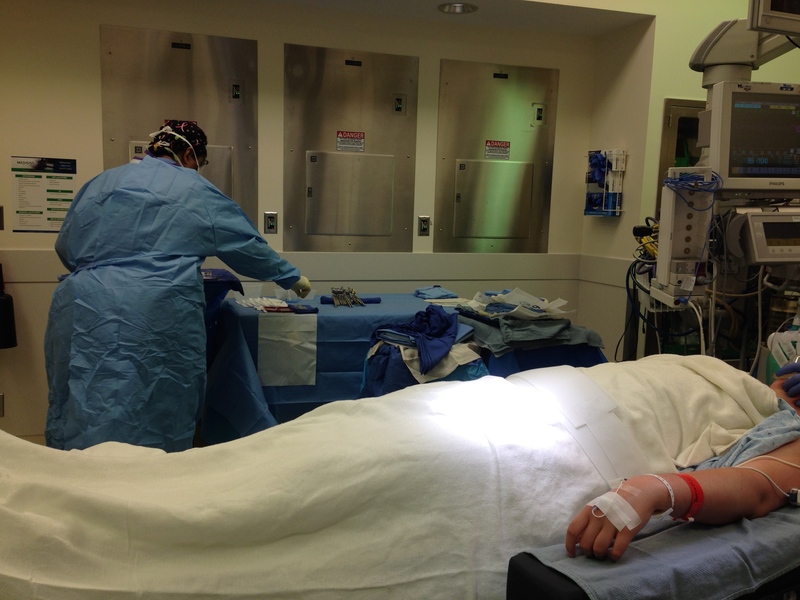 Photo taken by the nurse during surgery. This is a photo of the port that was in my chest for 11 months! This was taken in the OR right after they took it out. If you zoom in you can see the little needle holes from when they accessed the port before doing an infusion. A week after surgery I met with Dr. A, the neuro-ophthalmologist. 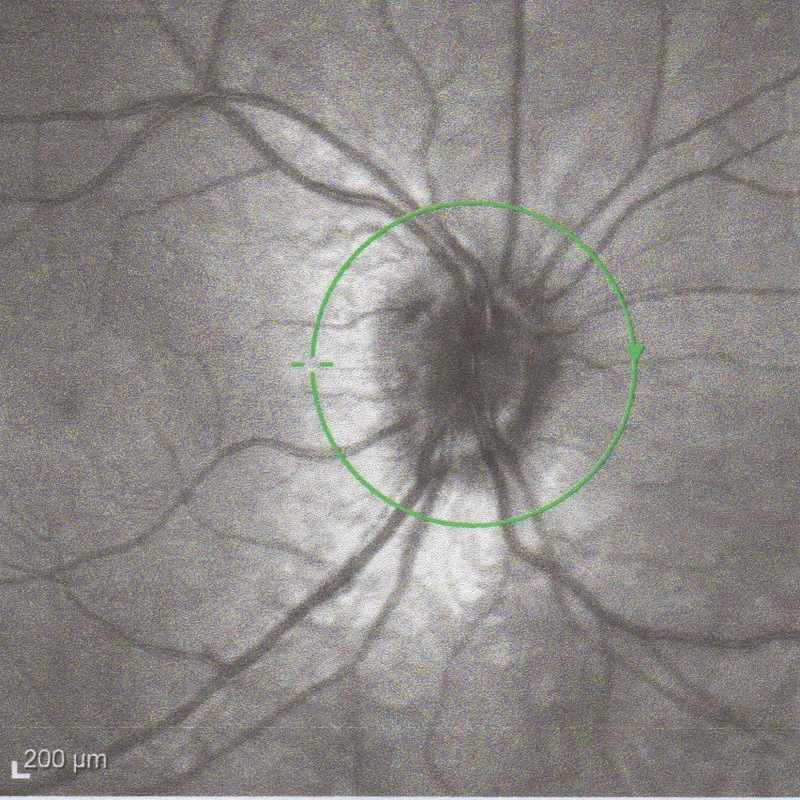 I did a visual-field test in addition to having some photos of the back of my eyes taken. What Dr. A then told us is that when people have the type of cranial swelling and double vision like I experienced when first diagnosed they expect to see some sort of retinal-nerve damage and vision loss. Amazingly, he himself seemed almost shocked when telling me this, I have no retinal-nerve damage or vision loss. Finally in mid-July I had an MRI and a follow up with my neurologist Dr. P. The MRI showed no change whatsoever meaning I was given the final clearing to come off treatment! Apparently, Vancristine and Carboplatin can have a really nasty effect on teenagers causing nerve damage and he himself seemed really surprised that I was able to finish all sixteen months of treatment. I decided to wait until now to update you all on my journey because not only have I been extremely busy with a chemo-free couple of weeks, but I also wanted to make sure everything was looked good before writing this post. Ultimately, I am truly blessed. I had some of the most amazing care, doctors, nurses, and support team, both in and out of the hospital, that I ever could have asked for and I can’t thank them enough. Is it unfortunate that I have a brain tumor? Of course. But I also take pride in knowing that I was able to overcome many obstacles to get to where I am today, and I couldn’t have done it without so many amazing and talented people. I have to especially thank my teams at CHOP and CNMC, my school, my family, my brother and my parents for everything they did to help me get through a challenging year of growth. Many people have asked me: is this the end of Josh’s Journey? Of course not. Eugene the brain tumor will always be there, and it’s always something I am going to have to monitor and be careful of. Over the next two years I will be having MRIs every three-months in addition to meeting with the neuro-ophthalmologist and the neuro-oncology team. I’ll make sure to update you all on my journey after each MRI to let you know how everything is going. I can’t thank everyone who has followed my journey enough. Your support has meant the world to me and helped me get through a testing time. I’m hoping to soon be launching a campaign to help bring snacks and food to kids who are doing chemotherapy infusions so please continue checking in for news on that. Below I’ve included a little timeline of photos from my journey. Straight out of neurosurgery back at CHOP. This was when things all started. My first infusion at CHOP. 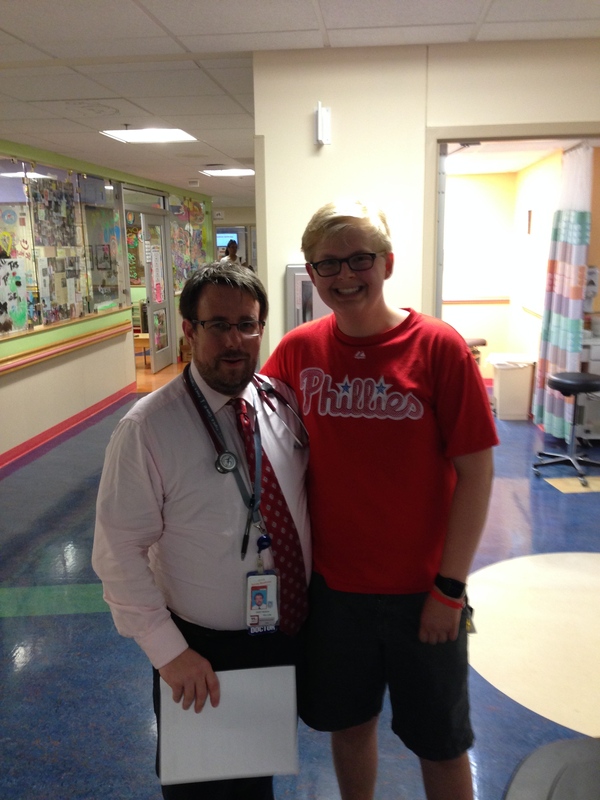 Me with Dr. B, my oncologist at CHOP. At this point I had finished 14 rounds of chemo and was transferring to CNMC in DC. 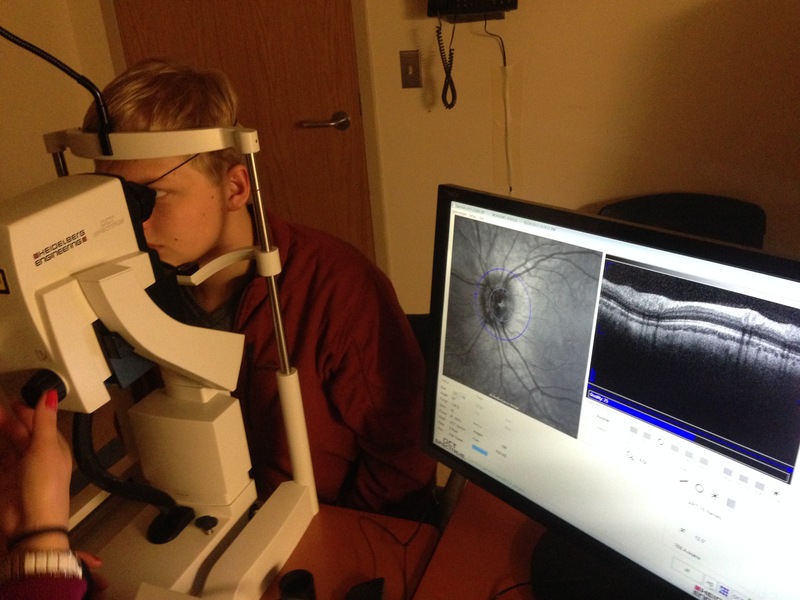 This is an eye exam; taking a photo of my retinal nerve. Photo comparing Eugene from one MRI to the next. One of the nurses putting an IV in my arm before having an MRI! Gotta stay positive! 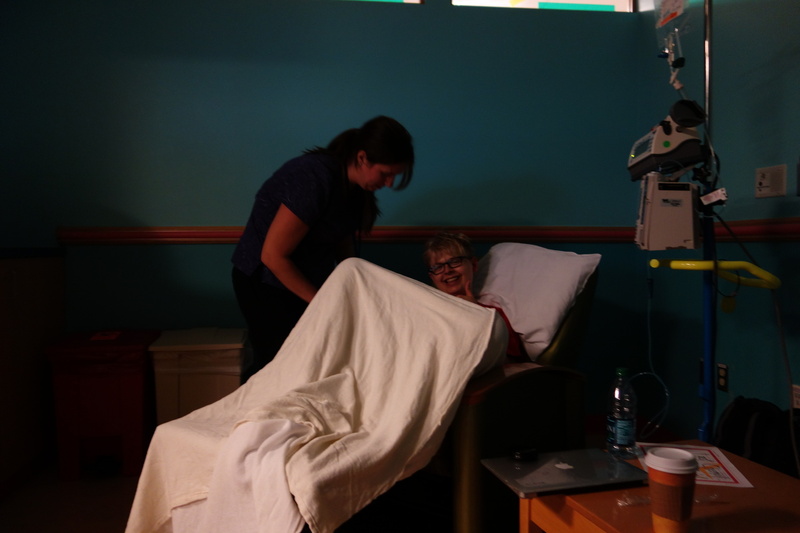 Getting cozy for my last infusion (June 12th, 2014)! 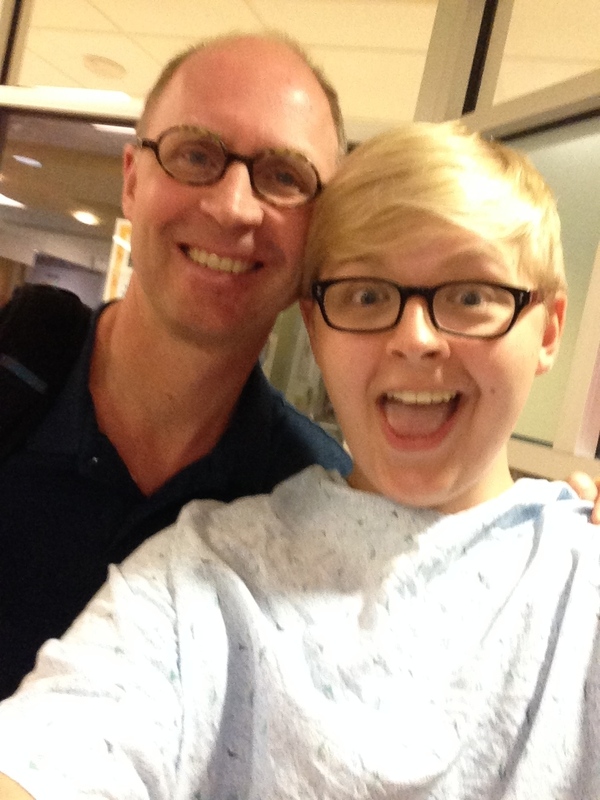 Selfie with Dad right before going in for surgery to have the port taken out. 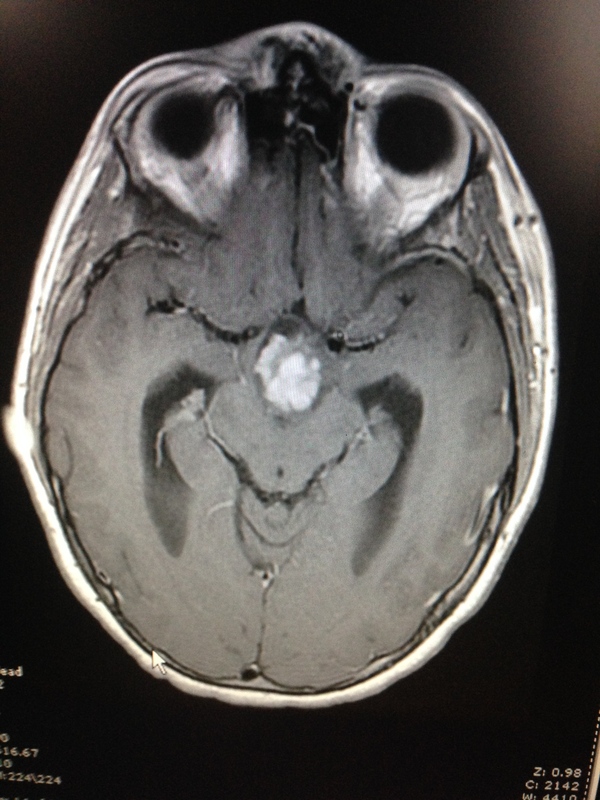 Finally, one last photo of Eugene the brain-tumor! To begin, I want to say that I really appreciate everyone’s patience with my lack of posts. It’s been an extremely busy last couple of months.The last time I found the time to post was Winter Break back in December and now it’s Spring Break, which I hope speaks to how busy I’ve been. Right now I’m away with my Grandmother, and we’re having an amazing time. Even when I’m not away and just in school I’m constantly reminded of how lucky and blessed I am. I’m blessed to have treatment that’s going very well, I’m blessed to have an amazing family, support network and education and I’m also blessed to have people following my story. In the past couple of months my treatment has been mostly uneventful. I’ve now completed thirty-three of my forty-one treatments, which means I only have eight treatments left. I’d like to think that I’m now in the final stretch! Most of my treatments have gone very smoothly. Normally, I have my infusion of Vincristine and Carboplatin on Thursday afternoons. I normally feel pretty sick afterwards but then I’m able to bounce back and feel okay by the end of the weekend. Lucky I’m still able to go to my classes on Fridays. One of the few “eventful” moments happened back in mid-January. I had returned from vacation with my family and was back in DC. I was in the middle of exams and studying like crazy. One morning I woke up and within an hour or so had a very strong migraine. I had just recently had an MRI and the migraine couldn’t help but make my mom and I suspicious that the pressure in my head had finally become an issue. We called the hospital and they look at the MRI. The MRI didn’t show increased swelling. Instead, they assumed that the rigorous study and particularly time spent in front of screens is what caused the migraine. My doctors then stressed the importance of letting one’s eyes rest to prevent eye strain, which is what I was going through. The only other “eventful” moment was during my most recent set (meaning a group of four weekly infusions) when during my first infusion I “bounced back” much less effectively than expected. Normally during my first infusion after a two week break I react normally if not somewhat better than after other infusions. This was a little concerning. However, after talking with my doctors it just seemed to be a strange outlier. The following week I reacted totally normally. In the next few weeks I have my next MRI and then I’ll be meeting with my entire team which includes the neurologist and the neuro-ophthalmologist. This means an entire day spent at the hospital. We’re hoping for good results. I’ll hopefully find time to post and fill you all in on the results. Again, I want to thank everyone who’s following my journey. Your support and well as your patience has been incredible. Well, right now I am in Australia, celebrating the holidays with my extended family, and I think it’s safe to say that I have a lot to be thankful for. Since my last update, I’ve completed another four rounds of chemo. One of the things that I’m thankful for is that my treatment continues to be smooth sailing; my counts have steadily stayed high, no signs of growth or swelling and remarkable recovery times after infusions. This means that in total I’ve now completed twenty-five of my forty-one infusions. Because of my trip to Australia I did one treatment two days early (moved from my normal Thursday to a Tuesday) and actually skipped one round of chemo. Interestingly enough my doctors felt as though skipping one treatment out of an originally planned forty-two wasn’t a big deal; especially considering that my treatment has been so successful. I think there’s something to be said about the fact that I don’t really have much to talk about in terms of my treatment. It’s been so uneventful and “regular” that to write everything out again would just be repeating myself. I now have roughly a month off before my next MRI and then hopefully starting my next maintenance round. Due to the uneventfulness, I’ve decided instead to talk about some of the things I’m grateful for. I’m grateful that my Grandfather’s chemo has been so successful. My Grandfather is fighting T-Cell Lymphoma and after having a few unsuccessful treatments he’s found the chemo that’s doing the trick! He’s quite an inspiration and together we’re the Chemo Company! Love you, Grandad! It’s a blessing to be over in Australia celebrating Christmas with my grandparents, cousins, aunt, and uncle. I’m grateful to be so fortunate as to go to an amazing school and to live in an incredible place in an amazing city. Moving this year has been quite a change in lifestyle; not only did I change schools but I also changed cities! I went from living in a house in the suburbs to an apartment in the city. Living in DC has been quite a change but it’s a welcome change! I’ve met so many new people and made many new friends. I look forward to continually establishing myself in an amazing new place. I’m so very lucky….. except that I’m not living in Nationals territory. Go Phillies, regardless of the fact we’re kinda terrible now. I’m grateful for an amazing set of doctors and nurses. I hope that all of my doctors and nurses know how amazing they are and that I owe them big time. I imagine that what they do everyday has many challenges by their amazing attitudes every time I walk in the hospital makes all the difference. I’m excited to be launching The Bear/Bare Cupboard (punny, right? ), my fundraising effort to fill the outpatient chemotherapy pantries at Children’s National Medical Center. I hope to establish an amazing set of donors who are willing to help make a change in a hospital that helps so many kids and families. More information to come later. I’m grateful for everyone who is following and supporting my journey. Your support means and does more than you can imagine. Finally, I’m thankful for my health and my family. It’s been a turbulent year, but I’m so thankful to be where I am now, not only physically but also mentally. More than anything, I’m thankful for the immense support of my family. Without them I don’t know how I would be where I am today. They’ve sculpted me into the person I am today and I am forever grateful. I hope that you all have an amazing holidays and enjoy so much needed (at least much needed for me) time off. Again, thank you. 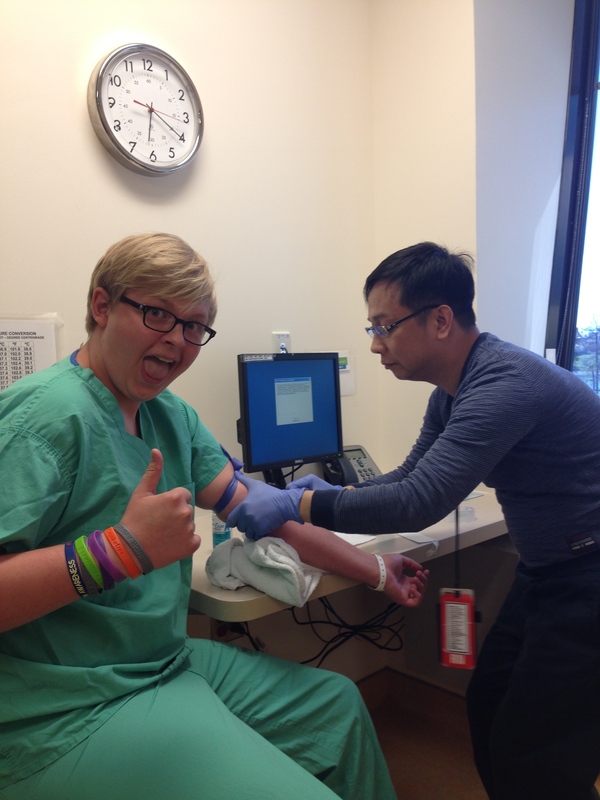 I just wanted to take a quick moment to announce that this last Thursday was my twenty-first chemotherapy infusion. The original plan has always been that I’d begin my treatments with a ten-week intensive period and then have 8 sets of 4 weeks of chemo (chemo being once a week during those four weeks). This meant that in total, by the time I hopefully finished my treatments that I would have done forty-two infusions. Well everything has been going so smoothly and this past Thursday was my twenty-first infusion. I’m half way there! Thanks again for following my journey. I could have never expected this type of following and the tremendous support I’ve received. Well today was the day. Because the day turned out to be such a marathon, I’ve decided to do this post chronologically. (9:30am) My parents and I arrived at the hospital and went straight to the oncology suite. We checked in and I was almost immediately taken back. I’m still not sure if this is because I had a pleather of things to do and many people to see or if it was just a quiet morning. As soon as we were placed in a waiting room a nurse took all my vitals. Everything looked good. Then I was taken by another nurse to have my post accessed. Everything was running very smoothly, just one thing after another. When I got back from having my port accessed a doctor, whom I hadn’t met before, was there to ask me a whole bunch of questions. These questions being a little more in depth than the usual infusion day. As she was doing the exam, more and more doctors started tricking in and by the time she finished the exam our little room had about ten people including the legendary, infamous, Dr. P. Business as usual, he did a few quick tests including looking back into my eyes. Then, with all the doctors ready to jump into their terminology that’s not meant to scare anyone but obviously does, I left. Even being sixteen, I’d much prefer to get the quick, simplified, sugarcoated version from my parents. (11:00am) My parents came out of the meeting and told me we quickly had to run downstairs because we were being squeezed in to see Dr. A, a well renowned neuro-ophthalmologist. As we signed in to see the doctor my parents filled me in on the meeting. I already knew some about the MRI’s results because the doctors had called earlier in the week. The MRI looked pretty good. The tumor has actually shrunken from the first scans and there’s an obvious change in certain parts that likely means it’s dying. The only down side was that the fluid pools that were obviously too big in my very first MRI (right before I had surgery), and had then been drained during surgery, were now starting to fill up again. In this picture you can see the first MRI (left) from right before my surgery. In that picture the fluid pools were much too big and that’s why during my surgery the surgeon opened up a place for the fluid to drain. 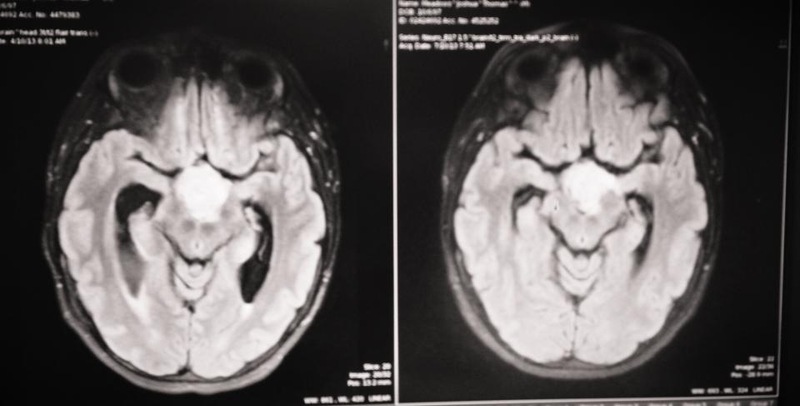 In the MRI from back in July (right) you can see that the fluid was draining really well. This most recent MRI looked a little different. 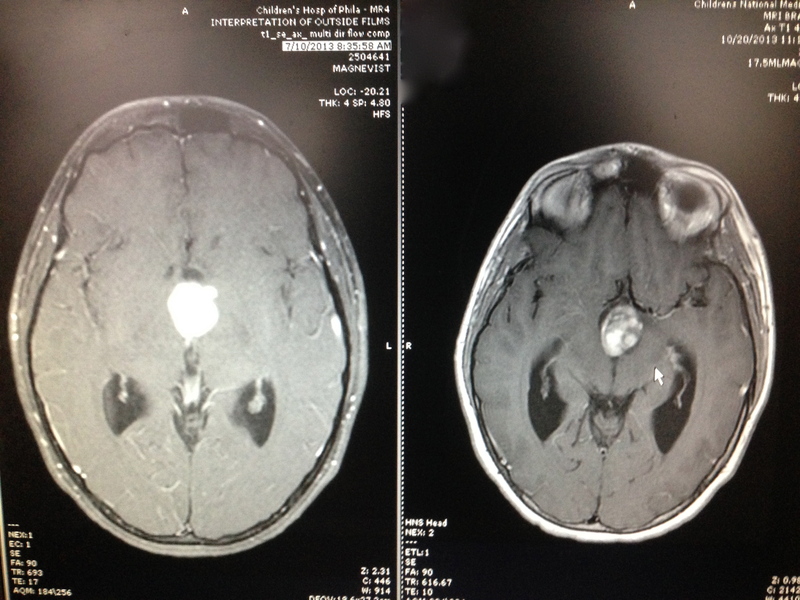 This is a comparison of my MRI from July (left) and my MRI from Sunday (right). As you can see, the MRI from Sunday shows the tumor has actually shrunk (2mm) and the change in coloration shows that it’s dying. However, in this image you can see how the fluid pools are starting to fill up again. The news the tumor has shrunk is great! It’s not as great to hear the fluid pools are filling up again, but that does happen. There are three possible treatment options for the fluid buildup. The first is to have another procedure in which the surgeon would just make another drain like they had done in my original surgery. However, my doctor’s don’t think this is the best option because there’s always the possibility the same thing (fluid buildup) will happen again. The next option is to put in a shunt. A shunt is a little device placed on my skull, under my skin. 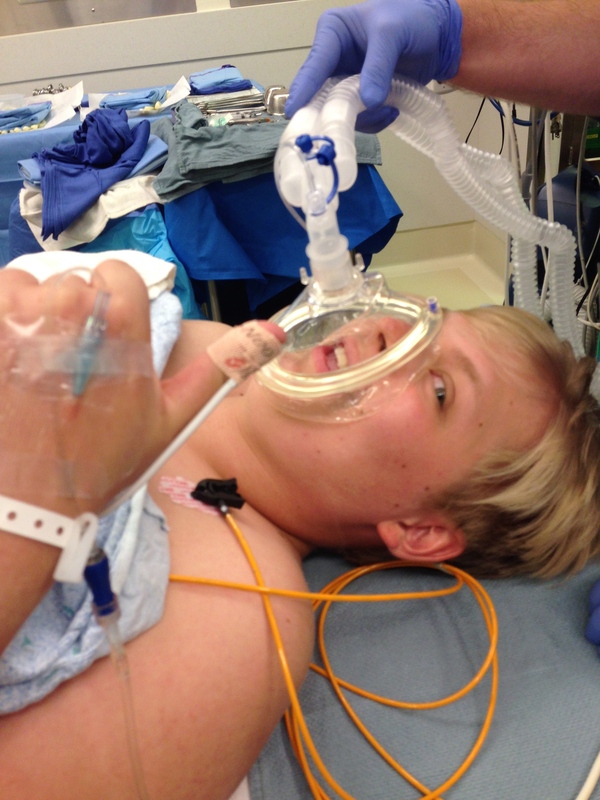 A tube is placed in the fluid pools of my head and then it runs through the shunt and down into my stomach. The idea is to take the extra fluid and relocate it. The third option is to do nothing, and evidently this is what the team, my parents, and I chose. As of right now, there’s no reason to believe that pressure and fluid is going to continue to build. The pressure might just relive itself and there would be no reason to have a shunt. We decided that we would wait until my next MRI in another three months and than see if there’s something that needs to be done. As this whole conversation was going on we were beginning to meet with Dr. A to get my eyes checked out. Everything was pretty routine. It started with a visual acuity test and then a visual field test. Both came back really positively. Then I met with Dr. A who looked into the back of my eyes before giving me dilating drops. When he came back twenty minutes later he looked into my eyes again and than I went to do some more tests. The first of those tests wasn’t even a test. It was an image to look at the retinal nerve in my eye. With the dilating drops they were able to take images that were the size of 200µm, which is equal to 0.00002 of a centimeter. Here you can see the doctor taking the photos of my eyes and the retinal nerve. Dr. A thought my eyes looked great. However, there was some retinal swelling he wasn’t sure about. He said that honestly it could be nothing. Just incase, I’m going to see him again in two months. 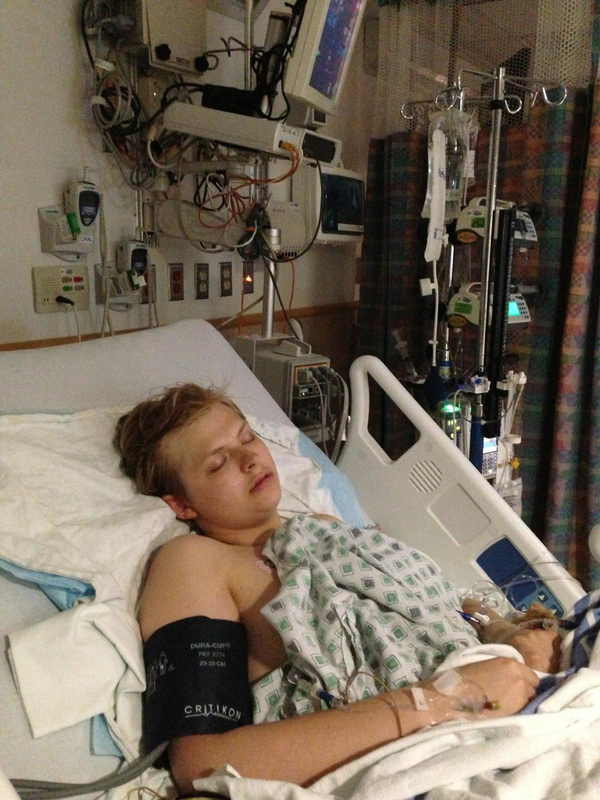 (1:00pm) Next, we arrived back at the oncology suite where I almost immediately began my premeds and infusions. One of my favorite doctors, Dr. R, came to talk with my dad and I. Basically, he reinforced the idea that it’s important to keep an eye out for things like headaches, vomiting and fatigue because those are all signs of increased signs of pressure. 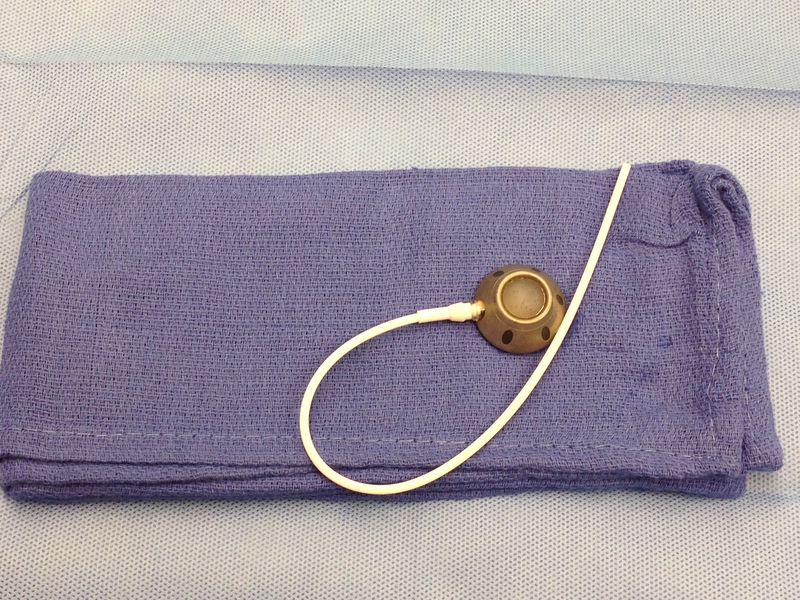 The whole point of monitoring the pressure is to protect my eyes and brain but to also see if I need a shunt. He asked me to keep a journal of when I have headaches, which I’ll definitely be doing. Dr. R also referred us to the neuro-surgery team just so that we could hear a little more from them about the logistics of the procedure and so that if something does need to be done then we have a connection. Afterwards, I did my normal infusions. Like always, the Ativan put me straight to sleep and when I woke up everything was done. (4:00pm) Arrive back home! What a long day! Thanks to everyone following my journey. If you have any questions, please let me know. Chemotherapy Rounds 14 through 18….. 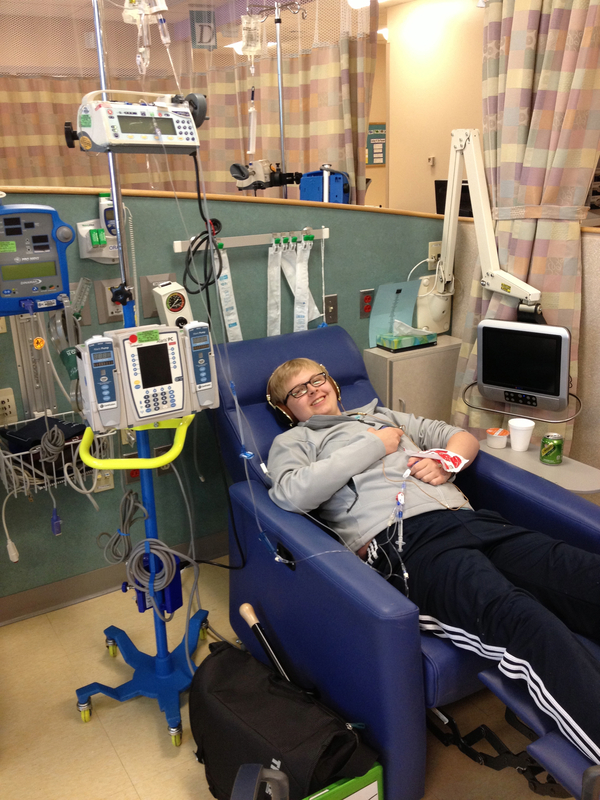 The joys of school and chemo! When I told people I was expecting my new school to be very busy and chaotic… I was never expecting it to be like this! I apologize for not posting for a few weeks. I’ve been looking for the opportunity to update everyone on my journey for a while now and it wasn’t until this long weekend that I found that opportunity. I began school on September 3rd, and began chemo again on the 12th. The really good news is that my chemotherapy has been very uneventful! As I said in my last post, the biggest differences between chemo in DC and Philadelphia is that in DC I see three doctors each time I go in for an infusion and that my Vancristine is done through a push instead of a drip. Otherwise the process is almost exactly the same. I love my new doctors and nurses in DC. They’re very friendly and obviously really know what they’re doing. One thing that I noticed that’s a little different between DC and Philly is that things are a little cleaner in Philly. Also, things like pantries and activities for kids who are doing infusions are much less well stocked in DC. Frankly, often the pantries and activities for kids in DC are just empty, which I find somewhat sad because I have a laptop but little kids often have much less to do. I’m thinking about starting a drive at my new school to collect snacks and activities for young kids. The biggest difference in my recents treatments has been doing chemo while going to school. School and chemo together have actually been very manageable. My school was amazing and set up my schedule so that my Thursdays have a very light work load and I don’t miss any classes for treatment. Friday mornings are also light meaning I can sleep in rest before going into school for the afternoon. My new school never sleeps, which at times can be exciting and at other times its really exhausting. On Tuesdays I don’t get home until 8pm because of debate. I’m really loving debate as an activity (I’ve never done it before). On Wednesdays I don’t get home until around 9:15pm because of choir. As I said the school never sleeps; I’m sure there are kids who are at school that late every night of the week. My next MRI is on the 20th and then I’ll start treatment again on the 26th. On the 26th my parents and I will be meeting with the infamous Dr. P again so review my MRI… so that’ll be interesting. I hope I get the opportunity to update the blog more regularly than I have over the past six weeks, however I can’t make any promises. As always if you have any questions or things in particular you’d like to to talk about, please just let me know . Thanks again for following my journey. I really appreciate the amazing outpouring of support and sympathy. 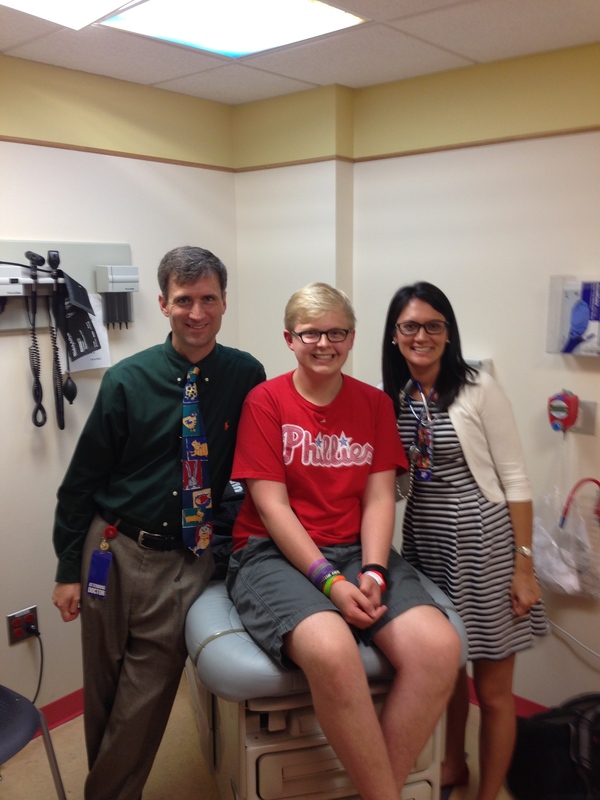 Last Thursday was my first appointment at CNMC (Children’s National Medical Center) in Washington, DC. I was not going in for chemo, but just going in to become a part of the CNMC system and to meet the doctors. The day began at around 11:00am when my parents and I arrived at the hospital. We were scheduled to start the day by meeting with the oncology team who would discuss medical history and how the oncology process works at CNMC. Then afterwards we would meet with Dr. P, a well renowned neuro-oncologist. When we first arrived my dad had to fill out a ton of paperwork. This was regardless of the fact that all of my medical records were sent down from CHOP. Finally after about a half hour of paperwork we were called back to begin the appointments. The appointments began with one of the oncology nurses taking my vitals so that in the future they would have a baseline to refer to and compare. Then we met with Dr. M, a neuro-oncology resident, who took down my whole story and medical history. Afterwards, he let me know that the schedule had changed a little and that Dr. P wanted to meet with my parents and I before we saw the oncology team. Dr. M then took us downstairs to the neurology suite where Dr. P’s office was located. When Dr. P arrived he did a very brief exam. He already had the medical exam that Dr. M had done to compare. Afterwards he began talking about my treatment with my parents and I. To my surprise he quickly revealed that the combination of Vancristine and Carboplatin, the two chemotherapies I’ve been using aren’t actually the two that he normally recommends for children my age. He revealed that this combination shows very good results in young children but less so in teenagers. This came as a surprise to me because I knew from my oncologist at CHOP that Dr. P was a pioneer in this chemotherapy-cocktail. He quickly began talking about different treatments; everything from other simple chemotherapies to radiation. I quickly began freaking out because I was very content with my treatment and I was under the impression that things were going really well. Another thing that was scary is Dr. P reviewed my two MRIs and showed us how in the second MRI there’s a flair coming out of the tumor. Apparently it’s very unlikely that the flair could’ve grown when the tumor hasn’t. It most likely came up in the second MRI because the pressure was released in my brain causing the flair to show. However, what Dr. P did say is that if in my next MRI (five weeks from now) the flair appears to have grown, he would most likely change treatments. In addition to the flair, he talked about how the MRI showed that I have an abnormality in my brain. This abnormality is what’s causing the tumor and as a result could be something that would need treatment in the future. At this point in the meeting I was pretty terrified. I did not want to change treatments and before the appointment I wasn’t under the impression that I would have to. Everything really came as a shock. Looking back on the appointment now I think I overreacted a little. What Dr. P was explaining was that if the treatment took a turn for the worst there are still many more other options. What was so scary is that his way of describing everything wasn’t too great and as a result he gave off the impression he wanted to change treatments. Regardless of the scare the message at the end of the meeting was that we were going to stick with this treatment until we had a reason we’d have to do otherwise. After that meeting I went back up to the oncology floor where I met with the oncology team. The majority of the discussion revolved around recapping the meeting with Dr. P. Frankly, a large portion of the meeting was spent calming myself down; this was a team effort. Along with Dr. M we met with a nurse practitioner and another neuro-oncologist. They described how the process takes place every Thursday when I come in for my treatment. Unlike CHOP the process is only scheduled to take between two and three hours from start to finish. This means it’ll be easy to do my treatment after school as then be in class the following day. Also, they talked about how when I come in for treatment I won’t just meet with one person like I did back in Philadelphia. Instead I’ll meet with all of these three doctors. The meeting concluded on good terms at around 3:30pm. I was happy the meeting was over. It was scary to talk about so many much different courses of treatment; specially since I’ve already down fourteen rounds of treatment on one regiment. In the end the important thing to take away from the whole ordeal is that there’s no reason to change treatment and we won’t be changing treatments unless there’s a reason to do so. I look forward to working with the team at CNMC.